Tiffiny Hall and Cassandra Dunn’s Original New Podcast! 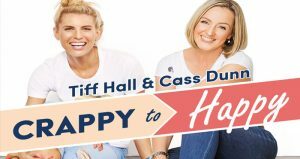 Tiffiny Hall along with Cassandra Dunn, a clinical psychologist, have released their exciting new podcast, Crappy to Happy. Tiffiny and Cassandra, who work together on the highly successful online fitness and wellness program TIFFXO.com, have come together to offer practical advice and tips to help people feel more energised, empowered, mentally strong, emotionally fit and HAPPY via their podcast. Crappy to Happy is available now on itunes, at PodcastOne.com.au and on the PodcastOne app.